I had a lot of fun rethinking Bea's room to make room for little brother, Jack. Creating a boy/girl shared room meant out with (some) pink and in with the blue... ok, aqua. It's a good sized room for one, but was a bit of a design challenge squeezing two kids in there. 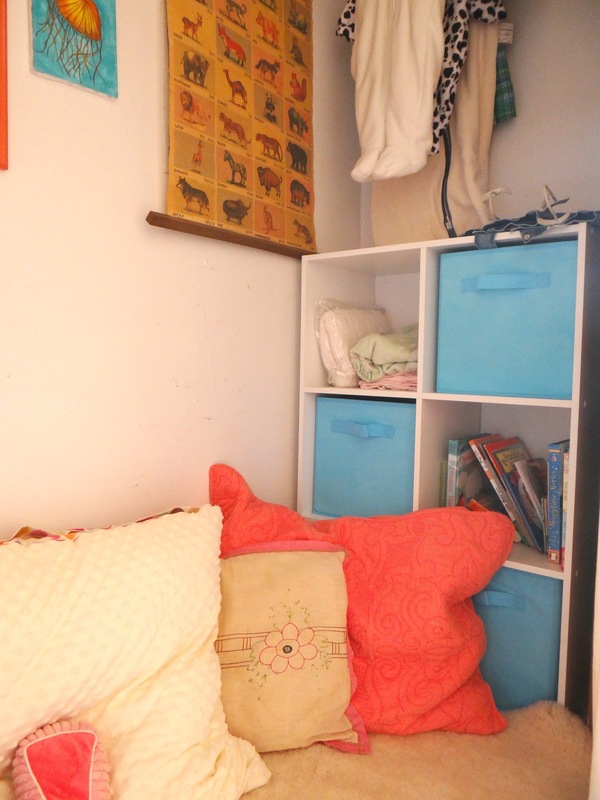 To help maximize space, I created a comfy-cozy reading nook in the closet. We bought neutral muslin to make the new curtains. Cheap and easy, and a great blank canvas for cute embellishments, like embroidery with a chunky yarn or even paint. Art work helped cover up the ugly grey electrical panel box in the back, as well as add color and make the space seem more playful and less like a closet. 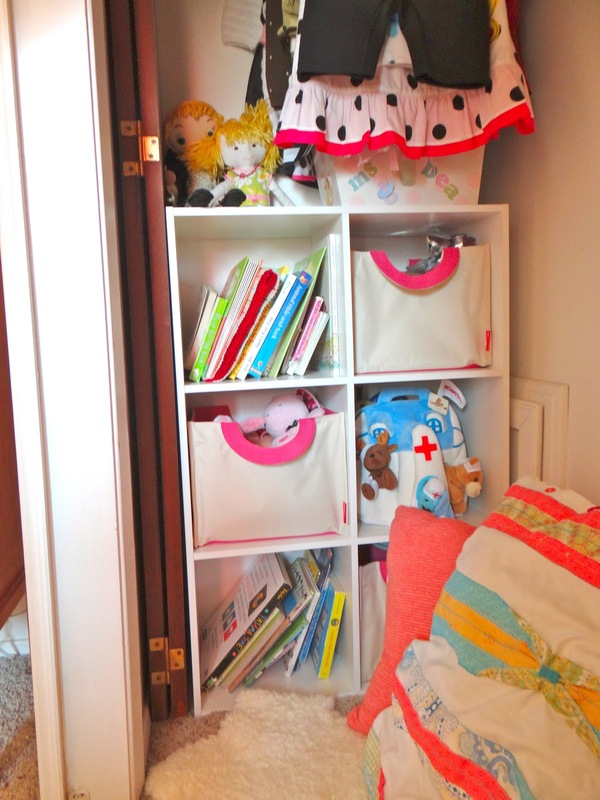 We still needed the space for storage so I divided the closet so that each kid would have their own area for their things. I turned the old cube storage shelf and moved it to Bea's end of the closet, and then bought a second one for Jack's end. Extra soft sheepskin rugs cover the floor and there are lots of comfy pillows to lay on. I bought the large pillows at Ikea and made the pillow cases for them. You can never have enough pillows. This space has worked great for us! Bea loves cuddling up in there with easy access to all of her books and toys. She also loves closing up the curtains for an easy secret hide away spot. 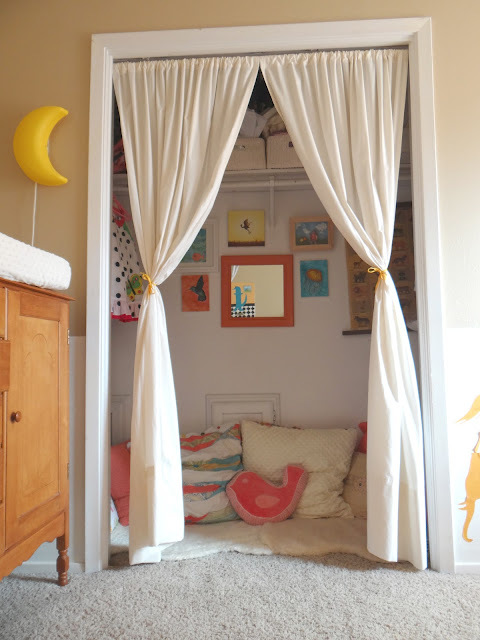 I look forward to when Jack gets a little older and they can enjoy their reading nook together! I'll post more about the boy/girl shared room makeover soon.